The Industrial Robotics CBT introduces the concepts of industrial robots and how they can be used in a plant or manufacturing system. The primary focus of the program is on automated manufacturing processes as well as the role of robots and all support equipment. The tutorial learning package provides both theoretical and laboratory support through a combination of multimedia learning resources and a robotics simulation software package to allow for the programming, testing, and debugging of robot programs. 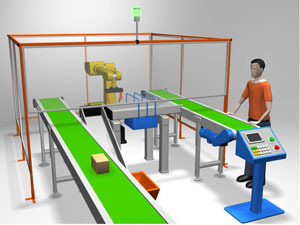 Areas of study include motion programming, palletizing, conveyor systems, computer networking, automated sorting systems, vision and tactile sensors and computer integration. The learning package is divided into 13 modules, each consisting of about ten sections, or major topics. The robot simulation software used in the program is based on the Fanuc LR series robot, which is regarded as the industry standard for industrial robots throughout North America and the world. 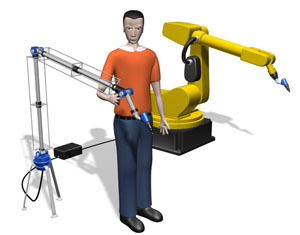 Learners gain practical, "hands on" programming of an industrial robot through a combination of teach-pendant programming, and 3D animations displaying the robot arm movement. 3D training environments include conveyor/palletizing, pick and place, spray painting and welding. Learning material for the program is provided on a USB. The interactive curriculum uses text, video, 2D and 3D animations, photos, audio clips and interactive robotics simulations. The following links provide you with detailed descriptions of the courses contained in the Industrial Robotics CBT. This module will provide the student with an overview of robot uses, with an emphasis on the most common functions. It includes applications such as welding, palletizing, assembly, injection molding, and spray painting. In addition, the module also includes specialized robotic applications such as surgical and inspection robots. Integration of 3D animation and robot simulation software enables the student to gain a better understanding of "real world" environments. This module also covers a variety of welding processes, including MIG and TIG, and contains an introduction to specialized end effectors such as welding and spray guns. An overview of mobile robots is also presented.